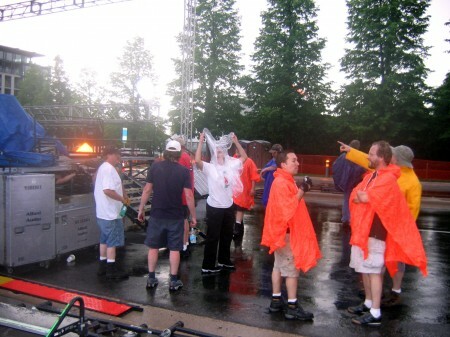 The biggest worry with loading in an outdoor show or a site specific work is RAIN! Last year, almost every single show or event we did in the Minneapolis Scultpure Garden was plagued by rain! This year, the weather was kind enough to hold off until after we had the crucial gear in place, tarped, and covered! I guess the elaborate interpretive rain dance I did last week totally helped! We did have to break for a few minutes to hand out rain gear and ponchos (soon to hit the runways of Paris in 2010!) so the crew could keep plugging along with unloading cases, setting up mic cable and sliding up and down a wet metal ramp to the stage. One of the other challenges of an outdoor event is space backstage for the bands. No dressing rooms, no permanent bathrooms, no rehearsal space, no green room for the 8oz bag of beef jerky and the brown M&Ms! So depending on who the bands are (their backstage requirements) and where they are coming from, we will create a backstage area for them to hang out in. For instance, The Decemberists usually travel with a bus for the musicians and a bus for the crew, but for Rock the Garden they were flying in straight from Bonnaroo, so wouldn’t have their buses with them. 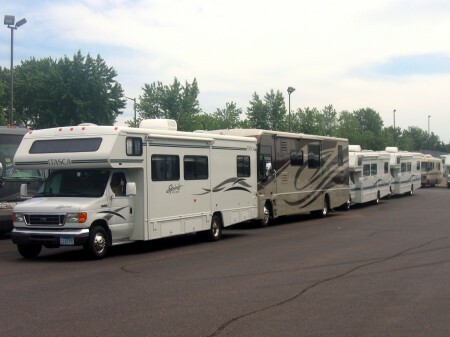 I headed out to Shakopee (which appears to be the RV capital of MN) to a rental place just across the street from Valleyfair with several of the crew to pick up trailers for the bands and drive them back to the Walker. Since The Decemberists had so many members, we ended up getting them a bigger (and incidentally, fancier!) RV that I have nicknamed “Big Mama”. EMP crew member David was pretty excited about driving “Big Mama” and is proud to report that she corners like crazy. In fact, the number 1 question I got asked on Saturday was “How much would it cost me to rent The Decemberists trailer?” I struck a deal for the Walker (yes, my soul is for sale…), so you will have to call and find out for yourself! You try to not jinx it by saying anything out loud, but we were ahead of schedule on Friday when we left!